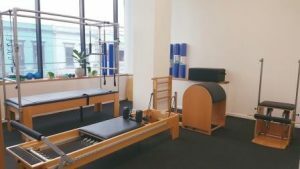 Our boutique, light-filled Clinical Pilates studio located within Yarra Medical Abbotsford. Clinical Pilates is an intricate form of rehabilitation. It is an individually tailored treatment method in the form of physical exercises that focus on core stability, optimal posture, breathing, strength and flexibility. How does Clinical Pilates differ from Generic Studio Pilates? Generic Studio Pilates sessions are often run in large groups, usually seen in gyms and studios, and offer one program that is supposedly “fit for all”. Clinical Pilates sessions are instructed by highly qualified health professionals with post-graduate qualifications who base their program on strong evidence on managing injuries. Programs are tailored for individuals and group sizes are much smaller. Why Choose Clinical Pilates at MOVE? Equipment: We use a variety of modalities such as mat work, spring-loaded machines (reformer, cadillac, ladder barrel, wunda chair) and small props (resistance bands, Pilates circle, fit ball, foam roller and hand weights) to help you obtain the most benefits from your session. Professional Expertise: Our sessions are instructed by qualified physiotherapists; experts in injury management, human anatomy and biomechanical function. We have post-graduate Pilates qualifications including DMA (Dance Medicine Australia), APPI (Australasian Physiotherapy Pilates Institute) and Polestar Pilates. Private and Semi-Private sessions: Private sessions are necessary to ensure your movements are executed with precision. We provide hands-on facilitation to fine tune your techniques. We want to get to know you and to understand your body’s requirements. Our groups are limited to a maximum of 3 people as we find a bigger group reduces the quality of your session and can lead to injuries. Initial Assessment: We will perform a detailed assessment consisting of postural alignment, movement and strength testing. Based on the assessment results, we will formulate a tailored program for you. We will also teach you the basic principles of Pilates such as positioning, breathing and correct deep abdominal muscle activation. Program Design and Updates: We will design a tailored program that is challenging and filled with variety. An individualised home exercise program will be provided to complement your sessions. Program updates are continually made based on your body’s changing demands. Please see our Fees page for pricing. An initial assessment is required prior to attending a Semi-Private session.